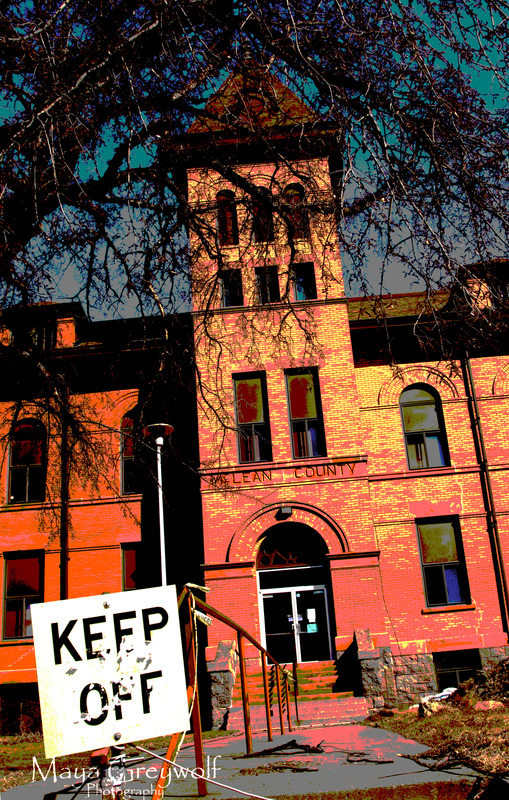 The “old” McLean County Courthouse in Washburn, North Dakota has been condemned to the wrecking ball as a result of bats taking up residence and spreading histoplasmosis (well, they’re the ones being blamed) to employees who worked in the building. Efforts to eradicate the bats failed and a new courthouse was built after a vote in 2010 approved the 5.5 million dollar price tag. The issue was first addressed and turned down by voters in 2002. The McLean County Heritage Preservation Foundation, an ad hoc group, formed with the intent to buy and renovate the old courthouse but their request was denied this past February. Histoplasmosis is a fungus that grows in the soil and is often found where there are bird or bat droppings. This particular website says the greatest threat is found in caves or… after an old building is torn down. The bats are getting evicted but I hope the landlords have more than a necklace of garlic to hand out to the other residents in town. It is colorful, yet very dark and haunting/scary in a vibrant way. I like the conundrum of noise in it; it is scattered with a lot of themes (building, sign, debris, trees, etc.) yet focused and concentrated. I can’t explain it in words, but I am sure you understand because you are the artist.